In an era where Instagram influencers, online artisans and countless other new-age jobs are proving to be both popular and extremely lucrative, it’s clear that the job market is changing. There seems to no longer be a staunch emphasis on tried and true traditional roles that require a four-year degree, but rather a shift towards finding a career or role crafted around ones direct interests and skills — regardless of how many years of education or professional experience are required. This new career option is being refereed to as ‘new collar,’ a job type that more and more of Gen Z is erring towards choosing, and in no industry does this ring more true than the restaurant industry. In the spirit of continuing giving restaurant hopefuls the chance to tap into these ‘new collar’ roles, the National Restaurant Association Educational Foundation hosted its 17th annual National ProStart Invitational, where over 400 high-school aged students competed in culinary arts and restaurant management in hopes of winning a slice of the more than $200,000 in scholarships that were awarded. school students at the 17 th Annual National Prostart Invitational on April 28, 2018 in Providence, Rhode Island. restaurant management skills and compete for $200,000 in post-secondary education. night’s opening ceremony due to travel issues on April 28, 2018 in Providence, Rhode Island. generation of chefs and restaurateurs. April 28, 2018 in Providence, Rhode Island. show off their skills and compete for $200,000 in post-secondary education. AOL: How did you tap into the food and restaurant industry? How did your career point you in a direction that led you to what you’re doing today? 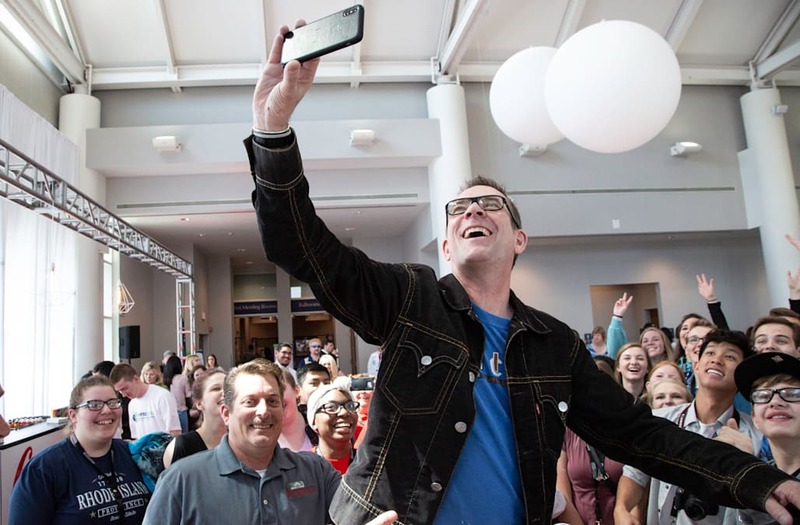 Ted Allen: “I’ve always loved cooking … I think it took a much more serious turn when I got a job at Chicago Magazine as an editor, because city magazines have always played a big part in covering the restaurant scene of their city — it’s an important part of the city’s life. I took [my role] a step further and asked if I could audition to be one of the food critics … I started doing that and I really enjoyed it, really took it seriously … it’s so complicated, it’s such an interesting puzzle to figure out which dish is better, which restaurant is better. AOL: What differences do you see in the restaurant industry today versus where it was decades ago? TA: "One of the great positives towards things happening in the United States these days is that this has never been a better country to be a food lover in. It’s better than ever — back in the ‘70s, you would go to a grocery store and if they had olive oil at all, they had one kind. Today, if you go to Central Market in Dallas or any of their other locations, they’re proud of the fact that they have hundreds of different kinds of olive oil. We, as Americans, have learned an extraordinary amount about food in the last 20 years. I think that Americans have become much more educated about food. At the same time, that interest is being reflected in the marketplace. You see burgeoning food scenes in Louisville, Nashville, both Portlands (both Oregon and Maine) … Portland, Maine claims to have more restaurants per capita than any other city in the country, and that may be true! I’ve had incredible food in Columbus, Ohio and Indianapolis, Indiana, the two cities I grew up in. It used to be that the good, creative artisanal cooking was only happening in New York, New Orleans and San Francisco — that is so not true today. It’s happening everywhere, and that is as an incredibly exciting thing. AOL: Why do you think this ‘new collar’ trend is emerging right now? Why is it particularly prominent in the restaurant industry? TA: "This speaks to another market force that we see happening, which is that restaurants are desperate for staff. That’s the biggest problem in many cities. In Portland, Maine, it’s a huge problem particularly because Portland has so many excellent restaurants but they don’t have the population to staff them. And this is why I think you see this ‘new collar’ trend emerging, where instead of focusing on … getting a four-year degree, people are going to two-year colleges (community college is playing a really crucial role in this as well) and people are finding themselves getting into the workplace sooner as a result, where they are desperately needed … restaurants need people, and people are finding ways to get there faster. It may be that the best path for your career is to go to a two-year college and either get the rest of the education later or get the rest of the education out of the marketplace in the real world. I think it helps when people like Michelle Obama are advocating on behalf of community colleges and seeing them as important parts of the educational system for people who need to learn, but also need to work." AOL: The restaurant industry is notoriously brutal. What are some traits that those aspiring to succeed in the industry must have? TA: "In order to pursue the culinary arts, if you’re talking about being in the back of the house and banging pots and pans around, you need to have a deep personal love for the craft and you need to have a tenacity and stick-to-it-ness. All of the judges that I work with are so steeped in their -- almost obsession — with the craft of cooking, with their love of food. Imagine a shark biting something with rows and rows of teeth and refusing to let go no matter how hard it struggles — I think you need that kind of ferocious devotion in order to work 16 hours a day, six days a week (maybe seven days) in order to pursue this dream. It’s extremely competitive, but for the right people, it’s incredibly fulfilling. I think also that you need to have not just a love of food, but a love of people, and appreciation for the fulfillment that comes from filling somebody up and making somebody smile. And I think all of those ingredients are essential to making it in this business because it is not easy. Even though I work with chefs all day long, they know I’m not a chef — they know I’ve never banged it out on a line and for that reason I always feel like it’s clear that I’m not a real member of the club — I’m not! I’m a friend of the club and we respect each other … I feel kind of left out actually!" AOL: Speaking of those chefs, when — if ever — do you foreseesee the celebrity chef phenomenon starting to dissipate from our day-to-day life? TA: "Never. It’s not going away — it has become an integral part of our culture. It’s not so much that it’s the fame that’s important, the reason the fame is happening is that Americans know so much more about food. And they want fresh herbs, they want great olive oil, they want to taste food from other cultures. It wasn’t like that in the ‘50s or the ’60s or really the ‘70s. It’s a permanent shift in Americans’ values and interests, and that’s nothing but good news. Martha Stewart, for example, who actually is not officially a chef … has taught me more about food than any chef alive — speaking directly and intelligently to her audience (me) about things that I knew nothing about in food — how to sear a duck breast properly, I learned that from her." AOL: What parts of the ‘Chopped’ kitchen experience differ most greatly from the real experience a chef would have cooking in a restaurant? AOL: What differences do you see in the technique and attitude between the amateur and professional chefs that come on the show? TA: "On one hand, a professional chef that went to culinary school probably has a lot more range than an amateur. But on the other hand, if it’s a professional chef who has specialized in their cooking early on and has been cooking only Italian food for 15 years and you get fish sauce, soy sauce and stuff they just don’t work with, they could be at a disadvantage. And this is why we always say the basket is the great equalizer. We had a woman who ran a falafel shop beat somebody who was an executive chef at a Gordon Ramasay restaurant. And part of that is luck of the draw — maybe we put something in the basket that worked really well for her that the Gordon Ramsay chef knew nothing about, maybe he didn’t know how to use that dried Thai rice paper that you hydrate in order to make a spring roll … maybe a Gordon Ramsay chef doesn’t use that product, he’s sort of up against it. There’s a certain amount of luck and a certain amount of randomness that affects all of this — sometimes we have to ‘chop’ a really good chef who just got the wrong basket. And that’s part of the drama that comes out of this competition. I think that speaks to how well-designed the competition is in the first place." AOL: What’s the hardest ingredient you’ve ever seen put in a basket? TA: "In a world where we’ve seen everything from pickled pig lips to eyeballs (literal eyeballs — so gross), it’s too hard to pin down because there have been too many thousands of ingredients to put it to just one. But overall, I would say the hardest ingredients are the ones that are already cooked. Like if we give you a key lime pie — that’s not something any chef would ever use as an ingredient to something else. And it’s already been cooked, so there’s only so much that you can do with it. I remember we had one leftovers challenge where one of the ingredients was a slice of pizza. And one contestant put the slice of pizza in a blender and we though ‘Oh, this guy is lost’ and it was delicious! He made some kind of sauce out of a slice of pizza. My sentimental favorite ingredient is the cold chicken in a can because it’s so uniquely revolting to me, especially with the jelly that forms inside of the can … why do we like to torture chefs so much and crush their dreams, I don’t know! I’m sure we’ll pay for it in the next life!" AOL: If you could make a basket for the contestants (one where you’re really trying to get them) what would your four ingredients be? AOL: Any advice to those wanting to tap into the restaurant industry? TA: "You should try to befriend somebody who runs a restaurant and see if they’ll let you work for free for a little while. Just go in there and peel vegetables and get a sense of what the environment is like, see if you start making friendships and see if you feel the energy and see if you want to be a part of it. Restaurant cooking is something that a lot of people get into as a second career … having a chance to work for free, doing the more grunt work of a restaurant, is where you’re going to begin because that’s how it is with any job … you have to do that part of it.